Kas Torin Windsbane braced against the bar counter, the bloody blade of a knife clutched in his fist. He gasped, feeling his heart thrum. He almost missed that block. The tattoo-faced attacker opposite him stood slack-jawed, aborting his move to jump the bar. No doubt he expected the lanky old barman, now pushing ninety, to die after one knife thrust. Obviously, he didn’t know much about Marrowshire, or its residents. The noise and motion in the common room of the Dulcet Unicorn had ceased with the suddenness of a lightning strike. Dressed in faded tunics and common muslin, the dozen odd men and women around the chamber previously engaged in merriment did not have the poses one would expect of an ordinary pub crowd well into their cups. Swords, knives, wands, and bows, many of them glowing with eldritch power, had appeared from nowhere and were now oriented on the would-be assailant. Tattoo-face gulped, he pulled at his ratty leather jerkin, head swiveling to take in the abruptly thorny scenery. Many of the faces in the crowd were seamed with age, but the weapons aimed at him all had one thing in common; they looked well-used. His gaze returned to the display over the bar, what had probably attracted his attention in the first place. 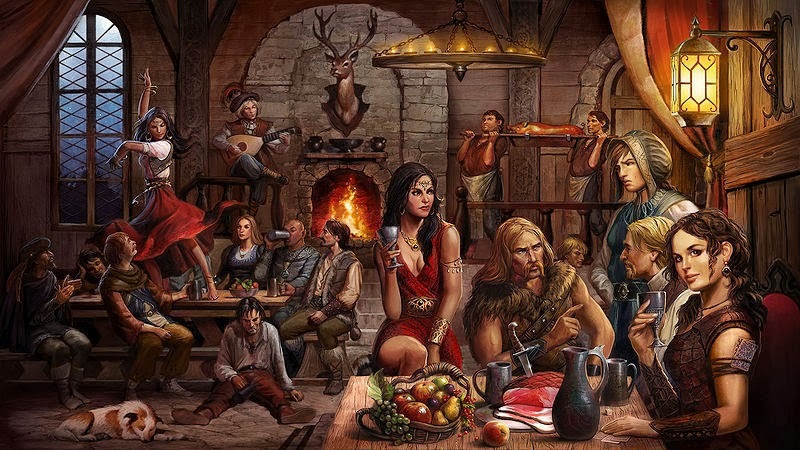 In a line above the many bottles of various spirits set in racks, a dozen portraits portraying Kas and his good buddy Tal posed in various city settings with different groups of women. Gold and platinum drinking steins from cities all over Titaan, many encrusted with jewels and filigree were arranged in displays all over the back-flashing of the bar. Just one of those cups would be a fortune to a small-time thug. Kas sighed. A smash and grab. Here? The man must have been living under a rock. Didn’t he know where he was? Som Wraithbane, the town fighting instructor, pushed his burly frame up out of chair with a grunt. He flipped back a few strands of long black hair now turning gray and cracked the knuckles of his mattock-sized hands. A grimace on his broad face, he loomed over the thief like a wave preparing to drown a swimmer. Though aging, Som’s open-front jerkin showed the giant pit fighter still possessed a formidable physique. Scars, campaign tattoos, and tribute marks bespoke a warrior’s journey measured in decades. The rogue glanced up and whimpered. Kas dropped the knife on the bar with a thunk and scowled at the palm of his cut and bleeding hand. He grabbed a counter rag from beneath the bar and pushed it against the wound. Yep, the summers were catching up. He could hear Tal’s I-told-you-sos in the back of his head. Damn crappy youth potions. “S-s-snuff?” the rogue repeated with a furrowed brow. Kas frowned. This fellow was the poster child for tragic imbecility. Som probably had more brains in his left fist. He glanced over to the corner where visiting entertainers plied the crowd for donations and applause. Gossamer gold hair falling about her features, violet eyes intent, willowy Amber Velrose leaned forward on her stool. The half-elven minstrel was the pub’s signature performer. She and Kas had flirted, but nothing more serious than friendship had occurred. Som made a growling sound. It made the floor boards rattle. Kas noticed then that the rogue had put his hand on his sword. Muscles in the warrior’s face had started to twitch. Lords, he’d be cleaning the idiot’s blood off the ceiling for a fortnight! “Anyone know where marshal Harod is?” Kas asked. “Someone get Cern,” another man said. “Let Zavier stay focused on figuring out what those Corwin idiots stirred up in the delving. That’s more important than this lackwit.” He flipped a hand at the rogue. A half-dozen of the town citizenry closed in and surrounded the hapless thief. He resisted but against more than a century of adventuring experience the out-of-towner would have had a better chance beating the demon king himself. Kicking and screaming they dragged him out to spend a night in the marshal’s brig. It was late and Kas had started the gradual process of cleaning up before closing for the night. He pushed a hand through his pale hair and glanced at his now rugged face in the bar mirror. The girls used to love that face. He should have listened to Tal and settled down sooner. Now he was old; old… and old. Worrying about his damn floor when he should have been concerned about getting his head cut off. Last tenday, Tal’s wife Terra had been a dear coming up to check on him. Maybe if he’d had a girl like that, his life would have been different. Lords she was a beauty. Still young and lithe, she seemed more beautiful now than when he first saw her more than four decades ago. Tal’s son Garn had stood stoically at her side, gaze scanning the room, hand on sword, ten summers young and rapidly growing to become every bit the worthy sentinel his father was. Kas opened and closed his hand, feeling the stiffness and noting the parched, ridged skin. Terra was a good woman and made polite excuses for Tal’s absence; being busy, having responsibilities to the schools and the Protectorate. He understood why Tal didn’t want to see him like this. What immort wanted to see their old buddy slowly drying up like a piece of aging leather? Things in the Dulcet Unicorn had calmed and the buzz from the night’s brief excitement died down. The crowd thinned down to a few scattered conversation groups swapping stories. A few of the town’s power guzzlers had settled in at the bar rail pumping out ale curls. Amber had finished her set and sat on the dais steps, sipping wine and plinking absently on her mandolin. The saloon doors creaked, heralding the entry of lanky russet-haired Marshal Harod. The veteran warrior looked tired, his rangy body curved as though under great weight, the polished links of his chain shirt seeming to hang loose on his shoulders. The tall man swung up to the counter, metal shod boots clanking on the rail as he gestured for the usual. No one could call Zavier Harod a handsome man, but he had what Kas called a ‘straight face’; someone people trusted and respected. Already pushing forty, the Marshal was still strong and a whirlwind force not lightly challenged. Kas poured and served with practiced flourish, pushing the ceramic stein gliding across the damp bar surface. “Long night, Zav?” he asked. Zavier rolled his shoulders and rocked his head side-to-side. “More the latter than the former,” he grumbled, taking another sip. “I told you I’d seen him before,” Amber called from across the room. “Well, I wish to Bane’s eyes you would have remembered where from!” Zavier snapped back. “Why, who was the little ill-mannered puke?” Kas asked. “Right,” Zavier said with a sniff. “That’s rough,” Kas said, refilling the Marshal’s cup. Catering to the ultra-violent dungeon-crawling hyper-active lifestyle! Teleport and monster proof housing for the freebooting slayer ready to relax! Was your last dance partner a troll battle-reaver? Did you just finish paying the last installment on your super avenging hackmaster 3000? Is the tax collector becoming suspicious about your assets? Here at Marrowshire we get you! No city guard – in fact no guard at all! We’re into mob justice at Marrowshire. No crime too small for hanging is our motto! No taxes – that’s right. We’re a free city. Sure, the kingdoms don’t defend us and we like it that way! Now with exclusive clericare – Sharikaar’s first city incorporated battle damage insurance plan. Now with special discounts on your raise dead needs! State of the art 24 hour apothecary for those late-night alchemical needs! Ranfast’s magic item emporium – yes, the Ivaneth exclusive is now here in Marrowhire, serving your mystical fencing and upgrade needs. Kel’Ishtari academy for higher learning (New) – by special arrangement Marrowshire now hosts a branch of the KIA school, the clear choice for higher intellects everywhere! Falorian Academy of War – That’s right, no more fighting at home, we have our very own sword studio! Endorsed by the Falorian Academy of Ivaneth. Temple of the Iron Rosary – for those bare knuckle brawlers, endorsed by the monestaries of the west and east wind. Upscale home starting in the low 10,000s! Marrowshire proudly welcomes the following new businesses to town!